The Pragofos 1100 complete phosphating process is suitable for the application on the steel parts just before their cold-drawing. The phosphate coating deposited enables very good adhesion of a drawing lubricant at a substantial reduction of the drawing forces. The water solution of the Pragofos 1001 concentrate should be applied by immersion. The package of the basic Pragofos 1101 concentrate: PE barrels, netto 50 litres or PE containers, netto 1000 kg. The Pragofos 1200 phosphating immersion process for the formation of a very thick zinc phosphate coating on steel substrates is very suitable to create the insulation layer between two sheets (e.g. transformer sheets). Besides, together with an oil-based or wax-based impregnation or under paints, the agent provides corrosion protection of steel substrates. It may be also employed alone as an agent for the running-in of steel parts or, alternatively, as a good adhesion base under the soap lubricants at cold-drawing of steel sections. The package of the components Pragofos 1201 and 1202: PE barrels 50 litres netto or PE containers 1000 kg netto. Other package can be agreed upon if requested. Pragofos 1220 je fosfatizační proces, při kterém se vytváří povlak zinečnatého fosfátu na oceli o plošné hmotnosti 15 - 30 g/m2. Vznikají hutné, homogenní povlaky, které lze použít jako protikorozní ochranu (po impregnaci olejem apod. ), jako izolaci pro trafoplechy nebo jako mazací povlak při tváření materiálu. Základní koncentrát k přípravě i údržbě lázně Pragofos 1221 se dodává v balení po 50 l (PE soudky). Jiné balení po dohodě. The Pragofos 2200 phosphating process, without any extra chemical accelerator, is suitable for the steel treatment just before cold-forming or drawing operations and is running at varying ferric ions content which are to be removed from the bath continuously by compressed air. The bath itself, with reduced copper and nickel content, is both nitrites and organic matters free and does not contain any other substances with possible adverse affect on values of both chemical and biochemical oxygen demands (COD and BOD) in the waste water. The phosphate coatings formed from the bath are compact, crystalline, fine-grained and of the specific weight value within 6 – 11 g/m2. The other distinctive bath feature is a restrained sludge formation, the sludge being predominantly caused at the bath regeneration process by the compressed air. The sludge may be readily separated by sedimentation and filtration. The basic concentrates Pragofos 2201 and Pragofos 2202 available: 50 litres netto in PE barrels or 1000 kg netto in PE containers. 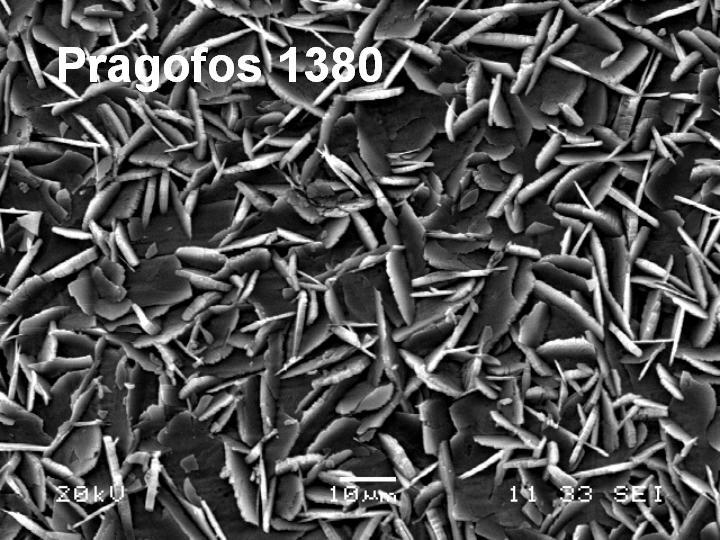 The Pragofos 1400 manganese phosphating process, without any other chemical accelerator, is nitrites free completely and causes the formation of compact and coarse-grained phosphate coatings of dark grey or black colour and of the specific weight within 10 – 30 g/m2 of excellent corrosion durabiity. For the formation of a very fine-crystalline phosphate, the activation rinse just before the phosphating process is necessary. 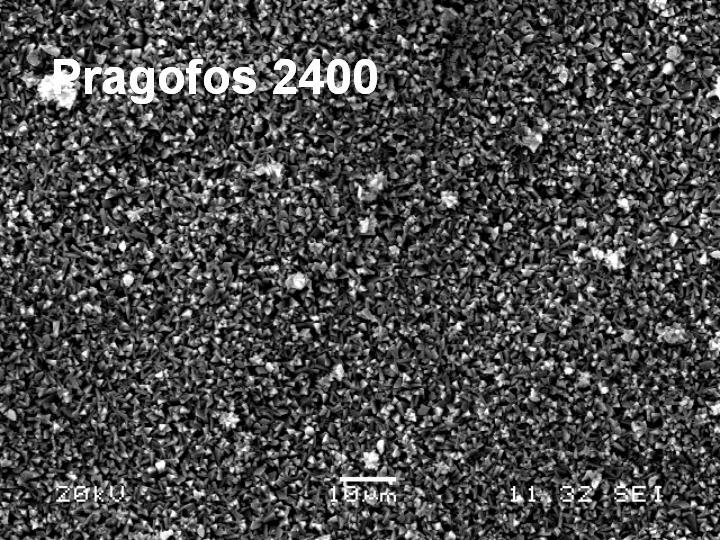 In the activation rinse in the Pragofos 1427 bath, just before the phosphating process, is used, very fine-grained phosphate coatings of the thickness 1-3 µm and specific weight 4-8 g/m2 are being created. On the other band, in te case of the activation in the Pragofos 1417 bath, a fine –grained phosphate coating but of larger thickness (about 3-15 µm and 8-24 g/m2 respectively) is being formed – the top volume of the thickness limit being achieved if an acid pickling operation is employed and the thicknesses at a lower limit if the pickling is omitted. The Pragofos 1400 is predominantly suitable for the phosphating of moving machinery parts or engine parts to enhance the overall lubricating affect and, therefore, to facilitate their running-in and to prolong their life. It may be, besides, used for a better anti-corrosion protection if compared with the zinc phosphate coatings. The package available: 50 litres netto in PE barrels (Pragofos 1401) or PE lined paper bags (Pragofos 1417, Pragofos 1427). The Pragofos 2400 manganese phosphating process is suitable for the formation of a sliding phosphate layer which is able to prevent the moving parts from their seizing. Compared with other older manganese phosphating processes with running temperature close to the boiling point, the Pragofos 2400 bath will work at as low temperature as 70 – 75 °C which results in substantial energy savings. For the formation of a very fine-crystalline phosphate, the activation rinse just before the phosphating process is necessary. 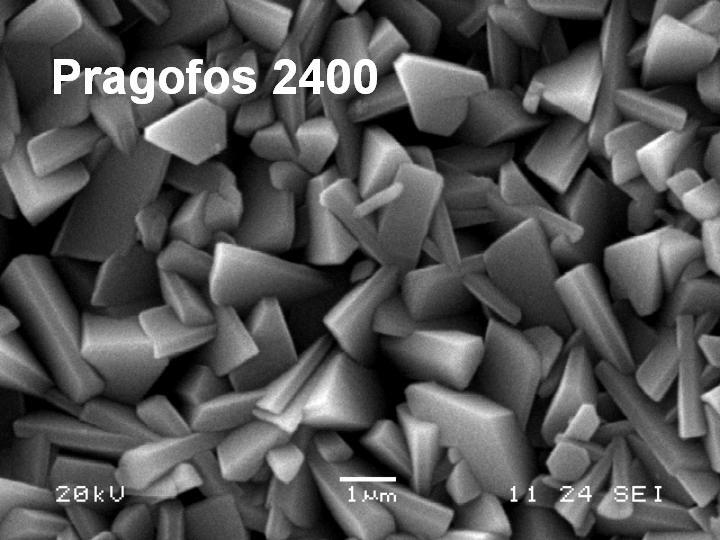 In the activation rinse in the Pragofos 1427 bath, just before the phosphating process, is used, very fine-grained phosphate coatings of the thickness 1-3 µm and specific weight 4-8 g/m2 are being created. On the other band, in te case of the activation in the Pragofos 1417 bath, a fine –grained phosphate coating but of larger thickness / about 3-15 µm and 8-24 g/m2 respectively) is being formed – the top volume of the thickness limit being achieved if an acid pickling operation is employed and the thicknesses at a lower limit if the pickling is omitted. The package available: 50 litres netto in PE barrels (Pragofos 2401) or PE lined paper bags (Pragofos 1417, Pragofos 1427). The Pragofos 750 agent enables degreasing together with creation of iron phosphate conversion layer in one bath and is convenient for the hand applications by mobile pressure spraying machines (e.g. WAP, Karcher etc.) where a continuous dosing of the agent into pressure water of the temperature 60 - 100 °C is made possible. The technology is particularly suited for the treatment of large machinery parts which cannot be commonly treated by immersion or in running-through spraying lines. The dosing concentration of the agent varies within 0,2 - 2 %. Package: 20 kg net weight in PE cannisters. 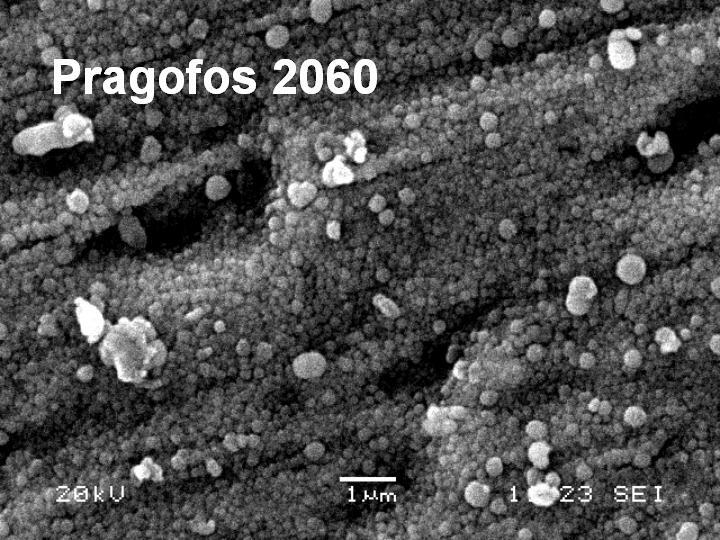 Pragofos 2050 A is an agent for the formation of a very compact iron phosphate coating on steel of the specific weight 0,5 g/m2, together with the degreasing operation in one bath. It may be used either as a sole surface treatment operation (optionally with a subsequent passivation operation in diluted baths of the Pragokor O-120, Pragokor O-130 or Pragokor BP agents, if necessary) or as an adhesion base under the paints including the powder ones. The application techniques include immersion, spraying as well as compressed-air assisted spraying. The package of the basic concentrate Pragofos 2051A: 50 litres netto in PE barrels. 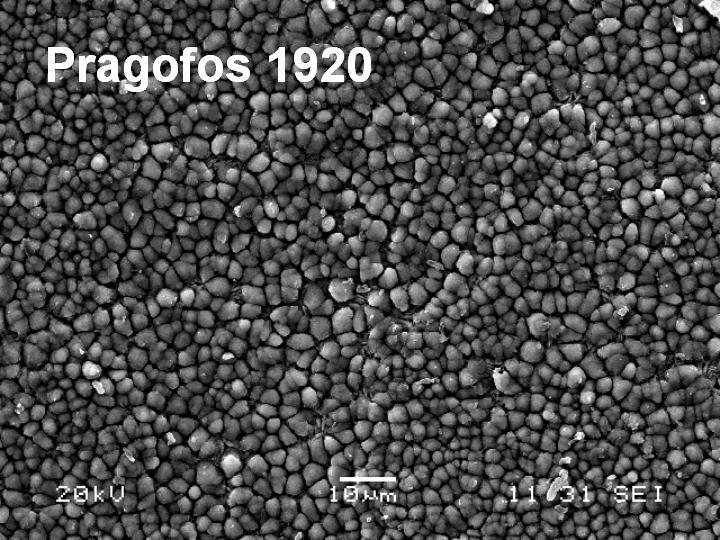 The Pragofos 2060 combined process is suitable for the formation of a thick iron phosphate coating of the specific weight about 1 g/m2 on the degreased steel substrates. The steel parts are enabled to be treated together with other non-ferrous metals such as zinc, aluminium, brass etc. without deteriorating of the phosphate coating quality, the other metals present, however, not being covered with the phosphate. 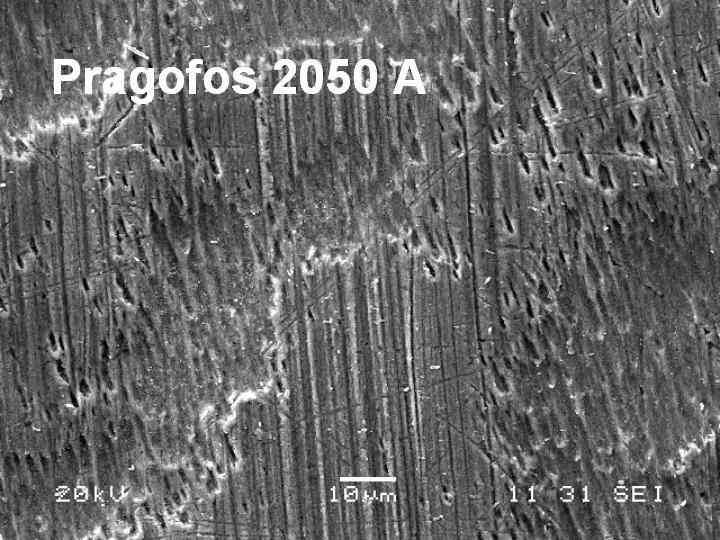 The Pragofos 2060 process, compared with the other similar iron phosphate baths, is capable to create two-to-three times thicker coatings the corrosion durability of which is almost up to the zinc phosphates. 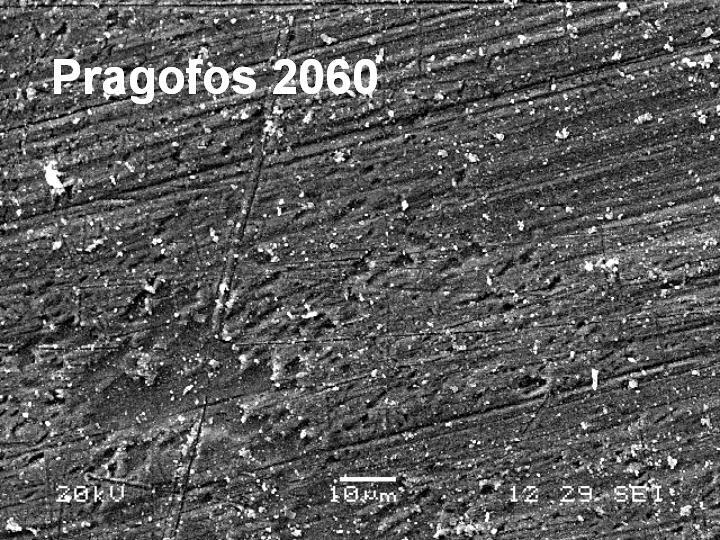 The Pragofos 2060 process is able to form very durable passivating layer on steel substrates as both adhesion and anti-corrosion base under all types of paints (water and solvent-based and powder paints). The phosphating bath Pragofos 2060 A may be applied by immersion, spraying as well as compressed air-assisted spraying, the spraying and/or elevated bath temperature boosting the overall phosphating process performance. The bath should be prepared by diluting of the basic Pragofos 2061 concentrate with water (about 3 litres of the concentrate for 100 litres of the running phosphate bath). The Pragofos 1380 process is convenient for the phosphating of steel, galvanized as well as zinc plated steel substrates under all types of paints (solvent-based, water-based, electrophoretically deposited, powder coatings). At the process, a very fine and crystalline layer of zinc phosphate of the specific weight 1,5 – 2,5 g/m2 will be formed. The phosphate coating created is capable of a very strong paint anchoring and, hence, boosts the overall anti-corrosion performance of the paints applied. Furthermore, the phosphating layer will impede and delay subcorroding of the paint if locally damaged to the bare substrate. The process should be used for the treatment of steel, galvanized or zinc plated steel being exposed in severe environments, such as for vehicles, agricultural machinery, household appliances etc., with high demands for corrosion durability and life. Package of the basic concentrate Pragofos 1381: 50 litres netto in PE barrels or 1000 kg netto in PE containers. 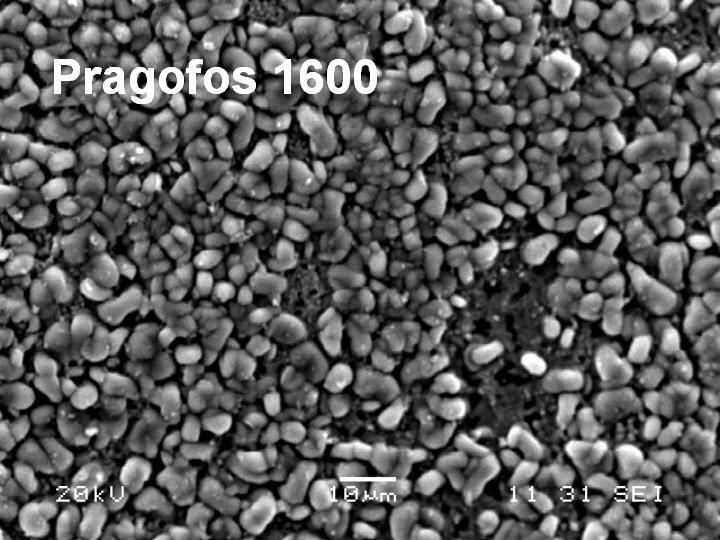 The Pragofos 1500 process is suitable for the formation of zinc phosphate coatings without any chemical nitrite-based accelerator content. It may be used for the phosphating of steel, galvanized as well as zinc plated steel substrates. The phosphate layer created is a good anchoring base under all types of paints including powder paints. As a sole coating, it is an appropriate temporary corrosion protection of the steel parts. In case the activation process in the Pragofos 1007 bath is employed just before the phosphating, the phosphate coatings resulted are of very fine crystalline structure of the specific weight 1,5 – 6,0 g/m2. The specific weight of the phosphate coating on a machined steel substrate may reach as much as 15 g/m2, especially if pickling operation being employed just before the phosphating. The thicknes values of the phosphate coating measured, anyway, are strongly influenced by the type of the steel to de phosphated as well as its heat treatment history.Package of the basic concentrate Pragofos 1501: 50 litres netto in PE barrels or 1000 kg netto in PE containers. The Pragofos 1510 process is suitable for the creation of zinc phosphate coatings, without any nitrite-based accelerator content, on steel, galvanized steel and zinc plated steel substrates. The phosphate coating provides a good anchoring base for subsequent conservation layers as well as all types of paints including powder coatings. The agent should be applied by immersion or spraying at the temperature within 53 – 60°C, the specific weight of the coating being about 1,5 – 4,5 g/m2. Just before the phosphating, the surface activation to enable the formation of fine-grained phosphates is recommended. The Pragofos 1600 phosphating bath is able to form coatings of an “egg-like” structure with a good anchoring capability under powder paints and rubber (e.g. rubber silent blocks or anti-vibration mounting) which otherwise are very difficult to adhere to bare steel. Owing to the half content of the crystalline water retained, compared with other phosphates, the Pragofos 1600 phosphate coating is even able to withstand much more elevated temperatures. The bath itself will provide the coatings of a fine-grained phosphates without necessity of the activation process before. The phosphates resulted are of the specific weight within 2,5 – 4,5 g/m2. Packages of both the basic concentrates Pragofos 1601 and Pragofos 1602: 50 litres netto in PE barrels or 1000 kg netto in PE containers. 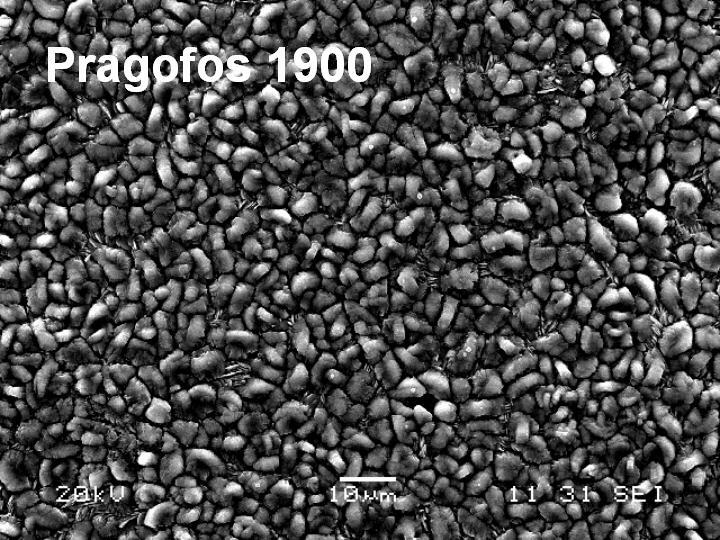 Pragofos 1900 is an up-to-date phosphating process, without any other chemical accelerator, nickel, copper as well as alkaline nitrites, for the formation of a zinc phosphate of enhanced corrosion durability the specific weight of which varies within 2 – 4 g/m2. The bath is formulated as a multi-cationic phosphating process which is able to create the compact phosphate coatings at the self-control of the bath iron ions content. The distinctive feature of the bath is a restrained formation of the bath sludge which may be separated by sedimentation and then filtered readily. Package of the Pragofos 1901 basic concentrate: 50 litres netto in PE barrels. 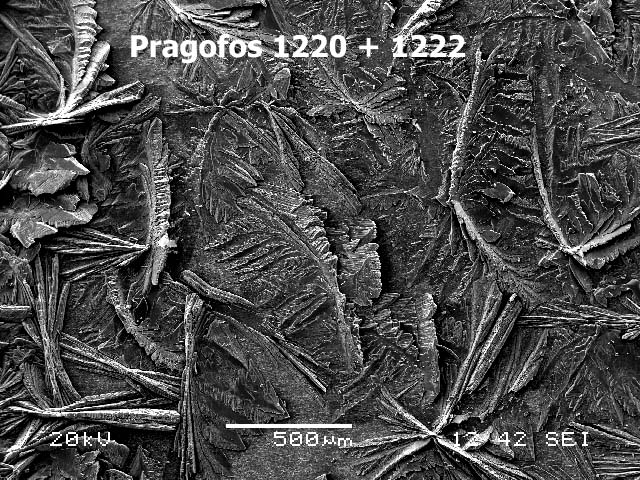 Pragofos 1920 is a multi-cationic phosphating process without the content of any chemical nitrite-based accelerator, which is able to create both compact and fine-grained crystalline zinc phosphate coatings of enhanced corrosion durability, the specific weight of which varies within 1,5 – 3 g/m2. The bath itself is running at the self-control of the bath iron ions content. The feature of the bath is a restrained formation of the bath sludge which may be, moreover, separated by sedimentation and then filtered readily. Package of the Pragofos 1921 basic concentrate: 50 litres netto in PE barrels. 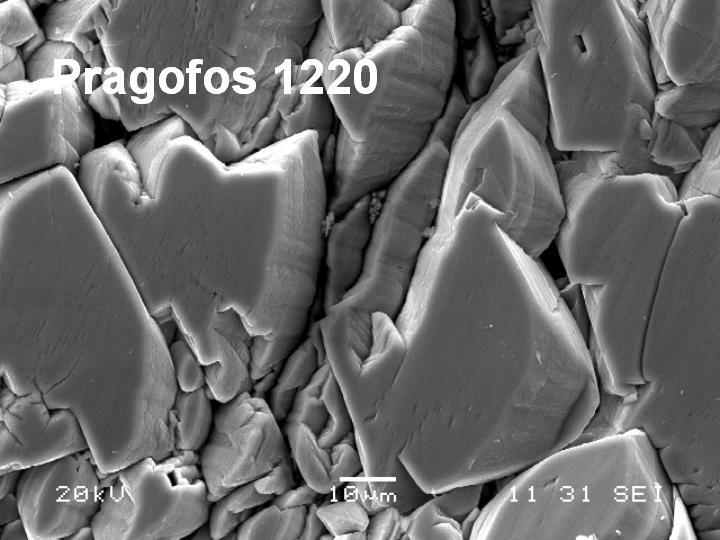 Pragofos 1930 is an up-to-date zinc and manganese phosphating agent, working without any auxiliary oxidant-based accelerator, especially suitable for the steel phopshating before its conservation. The agent deposited forms compact crystalline-based zinc and manganese phosphates of enhanced anticorrosion performance and capability to embed rather large surface concentration of the conservation agents, the specific surface weight of the phosphates deposited being within 6 – 15 g/m2. This multi-cation phosphate agent features the self-controlling ability of the ferrous ions content in the phosphating bath. The sludge resulting at the process is easy to be settled down and filtrated. The agent may be applied by both immersion and spraying techniques at the bath temperature within 48 – 55 °C. Pragokor BP is a non-foaming agent for the passivation of phosphated steel. It contains neither chromates and nitrites nor other hazardous substances. It may be applied by immersion or spraying techniques just after the final rinse step after the phosphating process. The bath itself is characterized by a low salts content which results in a suppressed adverse affect on the waste water treatment process. In the bath, the microscopic pores or other inhomogeneities in the phosphate coating are passivated against corrosion, the passivating affect on steel being more pronounced compared with many other six-valence chromium based passivating agents. The surface passivated is fully compatible with all types of organic coatings (water-based, solvent-based, cataphoretic, powder coatings etc.) and the passivating layer will boost substantially the overall protective performance of the combination phosphate-organic coatings. Low-foaming, both nitrites and chromates-free, emulsion-based agent with inhibition and neutralization affects, suitable for both temporary as well as inter-machinery operations-protection of steel, cast-iron and copper alloys against corrosion. It proves very well for the sealing and preservation of phosphate and alkaline blackening coatings and, unlike other preservation agents for metallic substrates, will not impede a possible subsequent painting. It should be applied by immersion or spraying techniques as the last operation just before drying, after the last rinse step. Once passivated, the passivation affect remains and the surface treated may be again rinsed in demineralised water because the corrosion inhibitors contained are strongly bonded to the surface by chemisorption. The surface passivated is compatible with all types of paints and powder coatings, only in the case of water-based paints the compatibility should be checked at first as the surface becomes a bit hydrophobic after the passivation. The feature of the agent is the high anticorrosion performance functioning even at a very low start-up concentration of the bath. To boost the inhibition affect, it is convenient to add the agent into the both degreasing as well as tumbling baths of the pH value ranging from weak acid to strong alkaline which results in passivation of the surface and anticorrosion protection in one combined surface treatment operation. In such a case, the compatibility with subsequent painting, if required, should be checked thoroughly at first. The addition of Pragokor Inhibitor 51 into the baths of the cationic-based agents must be avoided.